Desks are considered to be of primary importance in the office setting, and are deemed to be an individual’s personal space. They serve a lot of purposes whether at home or in the office setting, and are often where necessary equipment for working is placed, such as the computer and telephone. Aside from being used for writing, reading, or drawing purposes, an office desk serves as a storage area. This is the place where you keep several paper works, account types, and other documents that are needed. It is therefore an important thing to invest in office desks, not only as a convenient area for working, but also to organise and properly store your files. There are several types of new and second hand desks in Wollongong that buyers can choose from. Quality timber. 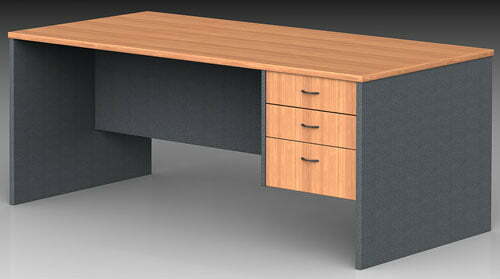 The timber desks we offer in Wollongong are guaranteed to be of high quality. They have solid 25 millimetre thick timber tops and sides, and this is finished with high quality melamine. We also supply different shapes, such as P-shapes, also with 25mm at the top and sides. Steel framed. Steel framed desks are chosen by some buyers for durability. They are also best known for their portability, and is most often used in offices that are often relocated on building sites. Reception. A reception desk or counter can be considered as the gateway to your office, and it also provides a first impression to the people who come to your office. Having a good reception counter makes the public more secure that you are a trusted and high-quality company. Ideally, a reception counter serves three functions: to impress, to inspire, and to perform. Your reception counter also influences the performance of your reception staff. If you have a good one, the chances are that your staff will be inspired with the belief that they are valued by the company, which will be conducive to an increase in their performance. A reception desk is home to various equipment including telephone switchboards, fax machines, computers, photocopiers, and other important items. Hence it is important to consider having a good reception counter as this greatly affects the operation of your company. Matching returns. A return basically makes an ordinary desk into an L-shaped one which allows for more space to work on. Conference. Conference desks should be chosen well and properly as this is the place where you meet potential partners and clients. They serve as the avenue where you discuss various proposals and talk about the future of the company with other members, so it is vital that you have something appropriate for this purpose. Computer. This type of desk highlights the important role of computers in the workplace and provides a suitable and comfortable area for this purpose. It features several shelves that would allow the support of a computer’s different components, including the keyboard, CPU, mouse, scanner, monitor, printer, and the like. Office workstations. Workstations are basically chosen to allow for the efficient use of space and may provide screening for the employee’s privacy. This is often used in call centres, and it may be customised to different shapes and sizes to suit your liking. Please see our Contact Us page for map and trading hours or simply call us today on (02) 4261 3055 for office desks in Wollongong.